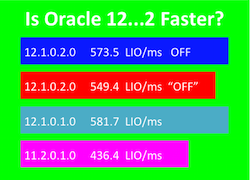 Off May Not Be Totally Off: Is Oracle In-Memory Database 12c (12.1.0.2.0) Faster? Most Oracle 12c installations will NOT be using the awesome Oracle Database in-memory features available starting in version 12.1.0.2.0. This experiment is about the performance impact of upgrading to 12c but disabling the in-memory features. Every experiment I have performed comparing buffer processing rates, clearly shows any version of 12c performs better than 11g. However, in my previous post, my experiment clearly showed a performance decrease after upgrading from 12.1.0.1.0 to 12.1.0.2.0. This posting is about why this occurred and what to do about it. The bottom line is this: make sure "off" is "totally off." What I discovered is by default the in-memory column store feature is not "totally disabled." My experiment clearly indicates that unless the DBA takes action, not only could they be a license agreement violation but a partially disabled in-memory column store slightly slows logical IO processing compared to the 12c non in-memory column store option. Still, any 12c version processes buffer faster than 11g. This is important: The results I published are based on a very specific and targeted test and not on a real production load. Do not use my results in making a "should I upgrade decision." That would be stupid and an inappropriate use of the my experimental results. But because I publish every aspect of my experiment and it is easily reproducible it is a valid data point with which to have a discussion and also highlight various situations that DBAs need to know about. You can download all my experimental results HERE. This includes the raw sqlplus output, the data values, the free R statistics package commands, spreadsheet with data nicely formatted and lots of histograms. Let me explain this by first showing the instance parameters and then the experimental results. There are some good lessons to learn! Pay close attention to the inmemory_force and inmemory_size instance parameters. In my experiment using the above settings the median buffers processing rate was 549.4 LIO/ms. Looking at the inmemory_size and the SGA contents, I assumed the in-memory column store was disabled. If you look at the actual experimental result file "Full ds2-v12-1-0-2-ON.txt", which contain the explain plan of the SQL used in the experiment, there is no mention of the in-memory column store being used. My assumption, which I think is a fair one, was that the in-memory column store had been disabled. As you'll see I was correct, but only partially correct. The parameter settings below are when the in-memory column store was totally disabled. They key is changing the default inmemory_force parameter value from DEFAULT to OFF. Again, the SGA does not show any in-memory memory space. 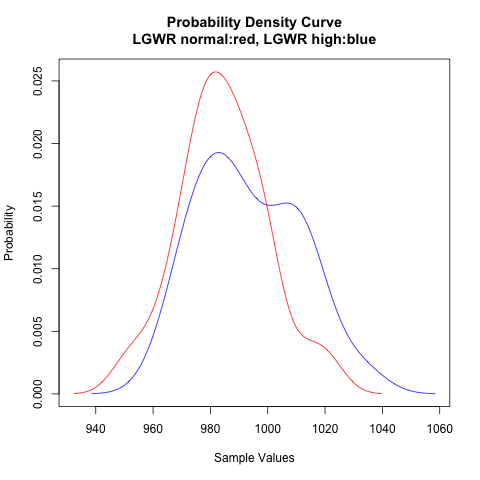 In my experiment with the above "totally off" settings, the median buffers processing rate was 573.5 LIO/ms compared to "partially off" 549.4 LIO/ms. Lesson: Make sure off is truly off. It is an unfair comparison! It is not fair to compare the "partially off" with the "totally off" test results. Now that I know the default inmemory_force must be changed to OFF, the real comparison should be made with the non in-memory column store version 12.1.0.1.0 and the "totally disabled" in-memory column store version 12.1.0.2.0. This is what I will summarize below. And don't forget all 12c versions showed a significant buffer processing increase compared to 11g. The key question: Should I upgrade? You may be thinking, if I'm NOT going to license and use the in-memory column store, should I upgrade to version 12.1.0.2.0? Below is a summary of my experimental results followed by the key points. 1. The non column store version 12.1.0.1.0 was able to process 1.1% more buffers/ms (median: 581.7 vs 573.5) compared to to "totally disabled" in-memory column store version 12.1.0.2.0. While this is statistically significant, a 1.1% buffer processing difference is probably not going to make-or-break your upgrade. 2. Oracle Corporation, I'm told, knows about this situation and is working on a fix. But even if they don't fix it, in my opinion my experimental "data point" would not warrant not upgrading to the in-memory column store version 12.1.0.2.0 even if you are NOT going to use the in-memory features. 3. Visually (see below) the non in-memory version 12.1.0.1.0 and the "totally off" in-memory version 12.1.0.2.0 samples sets look different. But they are pretty close. And as I mentioned above, statistically they are "different." 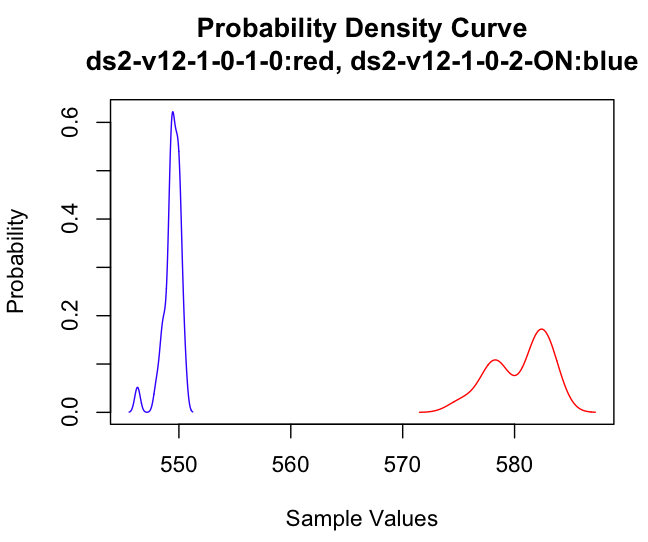 Note for the statistically curious: The red color 12.1.0.1.0 non in-memory version data set is highly variable. I don't like to see this in my experiments. Usually this occurs when a mixed workload sometimes impacts performance, I don't take enough samples or my sample time duration is too short. To counteract this, in this experiment I captured 31 samples. 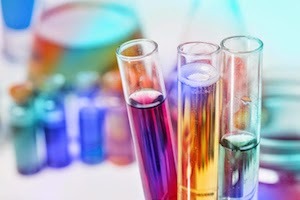 I also performed the experiment multiple times and the results where similar. 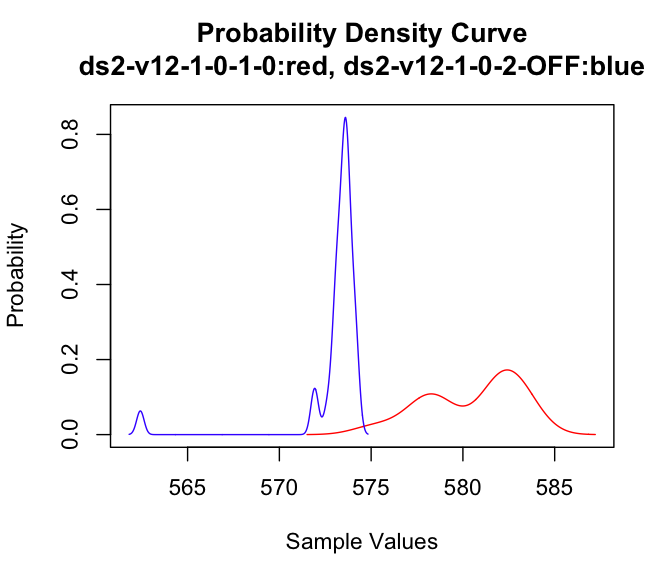 What I could have done was used more application data to increase the sample duration time. Perhaps that would have made the data clearer. I could have also used another SQL statement and method to create the logical IO load. 1. If you are not using an Oracle Database feature, completely disable it. My mistake was thinking the in-memory column store was disabled when I set it's memory size to zero and "confirmed" it was off by looking at the SGA contents. 2. All versions of 12c I have tested are clearly faster at processing buffers than any version of 11g. 3. There is a very slight performance decrease when upgrading from Oracle Database version 12.1.0.1.0 to 12.1.0.2.0. 4. It is amazing to me that with all the new features poured into each new Oracle Database version the developers have been able to keep the core buffer processing rate nearly at or below the previous version. That is an incredible accomplishment. While some people may view this posting as a negative hit against the Oracle Database, it is actually a confirmation about how awesome the product is. 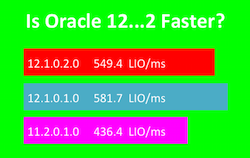 Is Oracle Database 12c (12.1.0.2.0) Faster Than Previous Releases? different. Again, all the details are in the Analysis Pack. 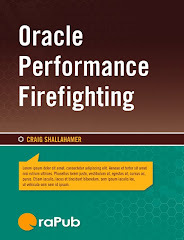 Does Increasing An Oracle Background Process OS Priority Improve Performance? 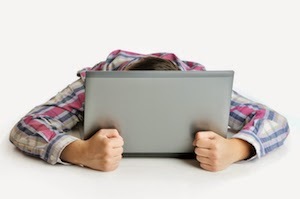 To generate the DML workload, I used my OP Load Generator. You can download it HERE. It's quick, easy and I'm familiar with it. I kept increasing the number of DML processes until the CPU utilization was pegged at 100%. While the database server was clearly out of CPU power, the log writer background processes were rarely seen as the top CPU consuming process. I used the "top" program to monitor the process activity. The top CPU consuming processes were almost always the Oracle server/foreground/shadow processes. As I'll explain in the Results section below, this has significant ramifications on the results.